If you experience painful contractions in your muscles that you can’t control, you know what a muscle cramp feels like. These can last for a couple of seconds or a few minutes. They are often commonly felt after exercise or overuse of a muscle. This can be from dehydration, mineral deficiencies or lack of vitamins. If your muscles are cramping regularly, it may be because you are lacking specific minerals and vitamins. It’s always a good idea to speak with your doctor before starting any supplements. Being deficient in vitamin B12 can be linked to low blood pressure, shaky movement, tingling and muscle weakness. These symptoms all can contribute to muscle spasms or twitching. B12 is required for healthy red blood cells, which is why you can suffer from anemia if you don’t have enough. Synthesis of DNA and nerve conduction also benefit from vitamin B12. It is naturally occurring in dairy, eggs, meat and fish. It is also water soluble, so can be stored in the body in case of shortages. Muscular skeletal issues such as leg and arm cramps can be caused by a lack of vitamin B6. A deficiency in B6 is commonly seen in alcoholics, causing the muscle twitching. This is because they don’t often eat well-balanced meals and have malabsorption troubles. This vitamin intake can help with cramping, especially when taken with other B complex vitamins such as B12. B6 is important to several chemical reactions in the body, including releasing glucose to muscles. You tend to need between 1.3 and 1.7 milligrams of vitamin B6 every day. This can be gotten by eating spinach, walnuts, bananas, or salmon. Like B12, B6 is also water soluble. This is another one of vitamins for muscle cramps. Muscle cramps, extremity tingling, and muscle twitching can all be from a Vitamin D deficiency. Other problems caused by Vitamin D deficiency are bone cancer, hypertension and diabetes. If you aren’t getting enough vitamin D, phosphorous and calcium may not be absorbed adequately. This can cause tetany, which makes for hand and face spasms. The most common way to get Vitamin D is through direct contact with sunlight and your skin. You can also find it in some foods such as liver, fatty fish, and milk. You need about 600 international units of Vitamin D to maintain healthy bone and muscle development. There are cases where Vitamin E can help with muscle cramps because of poor circulation. It helps to keep the blood thin and dilate blood vessels, promoting good circulation. It can be particularly helpful if you have cramping from varicose veins. For the best results, choose a 1,000 IU daily dose in the d-alpha-tocopherol form. Vitamin E is another one of vitamins for muscle cramps. Many people don’t understand that calcium is needed to normal muscle function, including your heart. Those who have low levels of calcium in their blood, may end up with tetani, where muscles contract continuously. This can cause heart failure. Luckily, this severity of an issue is rare, but getting less than your optimal level of calcium is common, especially in those who cut out dairy products for fear of weight gain. If you don’t drink much milk, eat cheese or yogurt, you may need to take a supplement. A severe magnesium deficiency is rare, but not getting enough is common, especially in western diets where fresh fruits, veggies, unprocessed cereals and grains and legumes aren’t eaten in large amounts. Those with muscle cramps may want to try eating more leafy greens such as broccoli, cabbage, spinach, lettuce, or get a supplement that has both magnesium and calcium, as they should be taken together. Please note that too much magnesium can cause diarrhea. Perhaps one of the most abundant minerals in food is potassium, yet some people are still deficient. This is often because people eat diets made of the same foods. It is also because fruit, cereals and grains are often avoided when dieting. If you drink too much water, potassium can be flushed from your system. The best way to insure you get your potassium is to eat five servings of veggies and fruits daily. You can get a variety of veggies, either frozen or fresh, and boil in chicken stock for a fat-free soup full of potassium. You can also use your juicer to make carrot, grape or apple juice for more potassium intake. Don’t start supplements without speaking to your doctor first. You should also seek your doctors advise while taking the supplements, this is because some meds can interact with potassium. Too much potassium can cause hyperkalaemia, which can be harmful. This is why it is most often recommended that you eat more fruits and veggies rich in this mineral. Most of those eating a western based diet will get plenty of sodium, as the largest portion of their diet is comprised of processed food. If you drink an over-abundance of water, sweat a lot, or have poor kidney function, you can end up sodium depleted and have muscle cramps. If you are working out hard in hot weather, you may need to increase your sodium. Most drinks like Powerade make it easy. If you suspect your cramps may be from not getting enough sodium, you should try adding a pinch or two of salt to your food over the next week or two. Besides vitamins for muscle cramps and above minerals, another important mineral is iron. It helps with oxygen transportation in the body. It can often be associated with restless leg syndrome. Blood tests are the best way to check for your levels of iron. There are some food items that are good for adding iron to your diet such as poultry, fish, nuts and whole grain. You should also seek medical advice before supplementing. 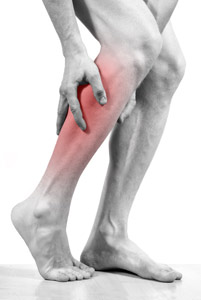 If you are experiencing a cramp, try stretching your leg. Follow up with massaging and rubbing the muscle gently. Add an ice pack if needed. Stretch before you exercise. Yoga can help with flexibility and muscle strengthening. Regular massage can also be beneficial. Make sure to warm up as well as cool down when you exercise. Get enough fluids. This means at least two liters every day, with more on days you exercise. If you perspire when you work out, when it’s hot, or during high stress, make sure to get electrolyte replacement. Make sure your diet has lots of veggies and fruits in it. Don’t where shoes that don’t fit well. Seek advice from your doctor if you have severe, frequent, or extended cramping. You may want to check your prescriptions to make sure they aren’t causing the cramping. If you have cramps in the chest that radiate through your shoulders, neck and arm, you could be experiencing a heart attack.